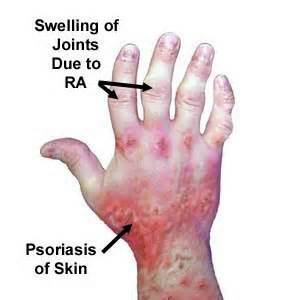 Psoriatic arthritis is a type of arthritis that has become inflamed by the presence of psoriasis. The National Psoriasis Foundation estimates that approximately 30% of psoriasis sufferers will develop this type of psoriasis. This type of Psoriasis can remain relatively mild, but in many cases it progresses to a severe and destructive disease. Typically, periods of outbreaks alternate with states of remission. Prolonged inflammation could result in permanent joint or bone damage, that is why early diagnosis and treatment is crucial. The exact cause is not known, but several studies suggest a genetic connection. Symptoms of the psoriatic-type of arthritis resemble many other diseases. There is no one test to positively identify the disease, but a doctor specializing in joint diseases may be able to accurately diagnose the condition with a variety of tests. Other symptoms separating psoriatic arthritis from other types of arthritis may include inflammation at the back of the heel or on the soles of the feet. Asymmetric – approximately 70% of patients are affected by this type. It is usually mild and does not show up in the same joints on both sides, meaning, if your right heel is affected, your left heel won't be. Usually less than three joints are affected. Symmetric – approximately 25% of the cases are this type. Joints on both sides of the body are affected simultaneously. Nearly half of the people with this type are left completely disabled. Arthritis mutilans – this type is extremely destructive and deforming. Luckily, less than 5% of patients are affected. The condition progresses over months or years and causes severe damage to the joints. Spondylitis - usually characterized by stiffness in the neck or spine, but may affect feet and hands, as well. Distal interphalangeal predominant – approximately 5% of patients have this type. It is characterized by stiffness and inflammation in the upper fingers. Visible changes appear in fingernails and toenails, as well. Although psoriatic arthritis is a combination of two diseases, they are usually treated separately. In most cases, your doctor will concentrate treatment on the inflammation and arthritis aspects. Generally, treatment involves anti-inflammatory medications combined with exercise. If the inflammation continues to progress, stronger medications may be prescribed. In less severe cases, you will be given an exercise program to follow at home. If the disease has progressed too far, you will need the help of a physical therapist. Programs are designed based on the physical capabilities of the patient. Either way, you will need to start with warm-up exercises, a hot bath or heating pads to help relax the muscles. Exercise will help strengthen joints and should be done regularly. There is no cure for psoriatic arthritis, but proper care can make it easier to live with.